Representatives of nine organisations belonging to the international ABIE (Australian Business in Europe) network met in Prague on 21st and 22nd October 2016. 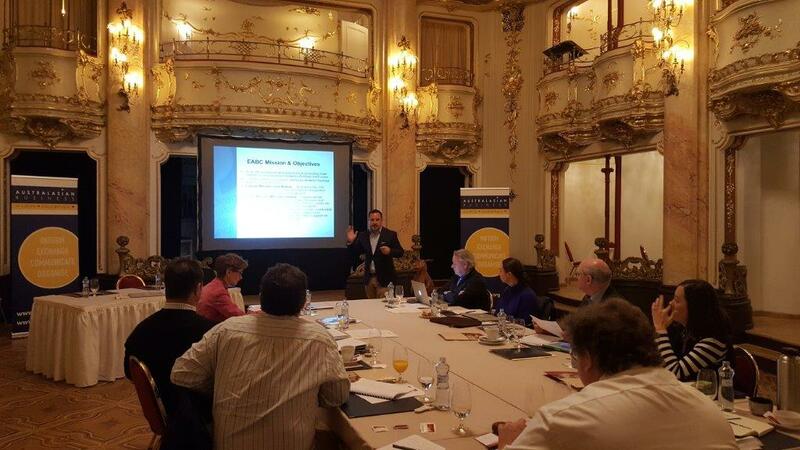 Hosted by ABIE Czech Republic in the marvellous surroundings of the Grandhotel Bohemia, delegates listened to member reports, resolved on governance and participation issues, and discussed potential policy topics that could warrant input from business groups. The meeting was also presented with a draft of the common umbrella website soon to go live. The meeting provided an excellent forum for the ABIE representatives to get to know each other after delegate changes in almost every affiliated organisation. A lot of momentum was created and possibilities for leveraging off each other and joint activities were discussed. Many thanks are due to the representatives of ABIE Czech Republic as the host and the EABC (European Australian Business Council) as the current coordinator for their splendid organisation of the meeting.